Hello and welcome to the 679th installment of the SWD. 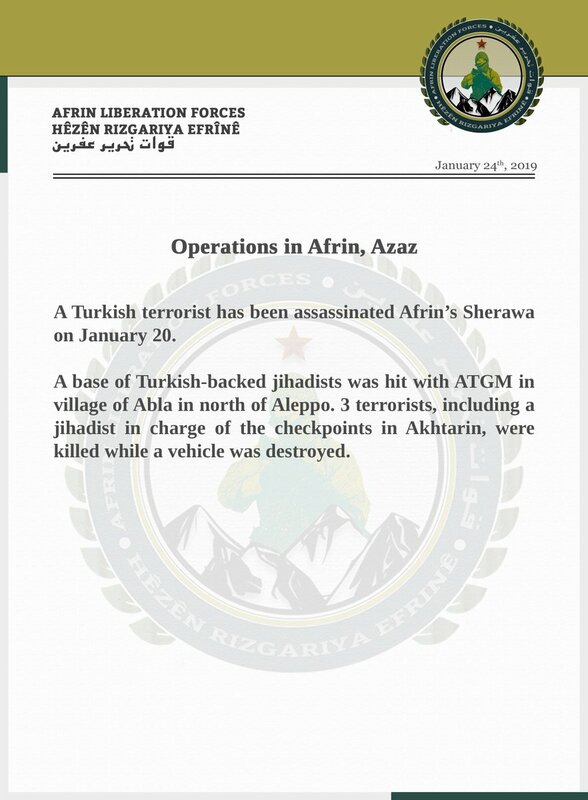 ‘Afrin Liberation Forces’ (Hêzên Rizgariya Efrînê) released a new statement claiming that four elements of the Turkey-backed Free Syrian Army were killed in two operations in Afrin and Azaz regions. Three vehicle-borne improvised explosive devices exploded in Qabasin, Al-Bab, and Al-Ghandoura in northern Aleppo. According to reports, one civilian was killed and ten wounded in Al-Bab, while seven civilians were wounded in Qabasin and three in Al-Ghandoura. ’Wrath of Olives Operation Room’s improvised explosive device targeted and destroyed a vehicle of the Turkey-backed Free Syrian Army in the city of Afrin. According to the operations room, one element of the Turkey-backed Free Syrian Army was killed and three wounded by the explosion. Hayat Tahrir al-Sham reportedly arrested two individuals belonging to the Islamic State in an operation in the village of Al-Deir al-Sharqi. 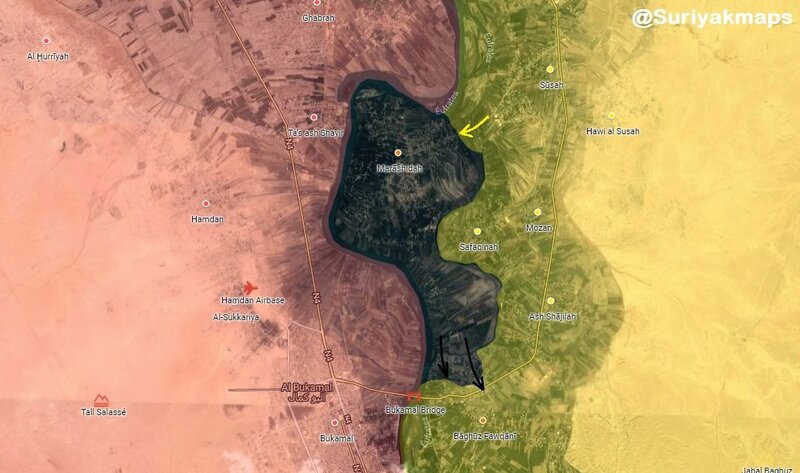 Syrian Democratic Forces clashed with the Islamic State at the outskirts of Marashida, with reports that the latter managed to reenter northern outskirts of Baghouz Fawqani. Afghan National Security Forces reportedly killed 40 and wounded 17 elements of the Islamic Emirate of Afghanistan, as well as destroyed five vehicles in Qaysar district, according to the Afghan Ministry of Defense. Afghan National Security Forces killed six and wounded three elements of the Islamic Emirate of Afghanistan, as well as destroyed two hideouts and six weapons depots and ammunition caches in Ab Kamari district. Islamic Emirate of Afghanistan ambushed and killed an Afghan National Army’s commander Nasir in Bazar area of Guzrah district. Afghan National Security Forces reportedly killed 28 elements of the Islamic Emirate of Afghanistan, as well as destroyed a vehicle and two hideouts in Khas Urozgan and Deh Rawud districts, according to the Afghan Ministry of Defense. Afghan National Security Forces killed seven and wounded five elements of the Islamic Emirate of Afghanistan, as well as defused 30 improvised explosive devices in Sangin, Jerashk, and Nahri Saraj districts. Islamic Emirate of Afghanistan attacked two Afghan National Security Forces’ convoys in Deh Adam Khan and Seydano areas of Jerashk districts. According to the Islamic Emirate of Afghanistan’s Al-Emarah News, 15 elements of the Afghan National Security Forces were killed and wounded, as well as three armored personnel carriers destroyed in the attacks. Afghan National Security Forces killed two elements of the Islamic Emirate of Afghanistan and destroyed 20 improvised explosive devices in Maruf and Maywand districts. Islamic Emirate of Afghanistan’s snipers killed two elements of the Afghan National Army in Sara Baghal area of Maywand district.